Do you do a lot of driving and sitting at work? If you do, you'll know that most office chairs just don't provide the support and comfort you need - which is why you need a seriously good seat cushion! Unlike a lot of less effective seat cushions that use layers, gel, and other ineffective budget materials, we only use straight up thick, dense memory foam that is comfortable and stays right where you need it most! We use the best balance of memory foam possible to give you a density of 45 kg/m3- This means you get the support you need (even if you weigh over 250lbs) - and it won't fail you over time or with regular use. The soft microfiber wraps are completely removable and washable so they're easy to keep clean and looking sharp. Unlike most sellers, we include 2 covers - both our them are machine washable so you can keep your support pillow looking great. One of the covers is made from a soft, gray velvet material and the other is breathable 3D mesh. We know that back pain and discomfort is at its worst when sitting for long periods of time, like when commuting, working at your desk or squashed into a plane seat. Fortunately, you can take our cushion with you ANYWHERE without breaking the bank on a new chair! We want you to have the best customer experience possible when buying with us, which is why we cover you with an 90-day money back guarantee. 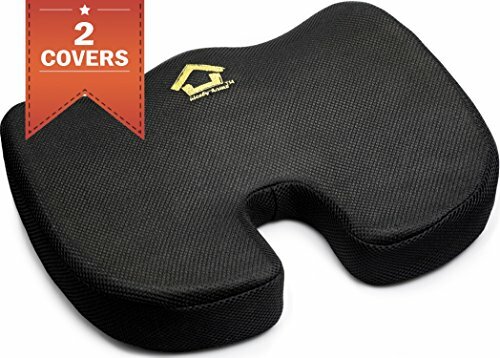 ✅ NO MORE PAIN FROM SITTING: If you spend hours working at a desk or driving, this coccyx pillow will give you the support and relief you need. Our driver seat cushion is perfect for pain relief if you suffer from sciatica, lower back pain, tailbone pain, poor posture, piriformis syndrome, herniated discs or overall back fatigue. It's also great for pregnant women and new mommies who need that extra support. ✅ PIECE OF CAKE TO CLEAN + 2 CHANGEABLE, WASHABLE COVERS: You can easily take off the covers and throw them in the washing machine (at about 104F) to keep them looking pristine! One of the sciatica relief cushions is made from a soft, gray velvet material and the other is breathable 3D mesh. ❗❗❗ TOTAL COMFORT OR YOUR MONEY BACK! At NICELY HOME, we back up all our products with a 100% no-worry money back guarantee. If for any reason your back and posture don't love this car driver seat cushion then just return it to us within 90 days and you get your money back or a totally free replacement - no questions asked! ✅ NOT TOO HARD, NOT TOO SOFT TOTAL COMFORT DESIGN: We use a proven memory foam balance with a density of 45 kg/m3 in all our orthopedic pillows. This means that it's not too soft, not rock hard and will keep you comfortable, even if you weight more than 250lbs. ✅ NO NEED FOR A NEW CHAIR, TOTALLY UNIVERSAL: You don't need to splash out on a brand-new office or work chair that costs a fortune. This sciatica seat cushion is designed for your car seat, office chair, wheelchair, any home chair or seat on an airplane, bus or train. The special U shape relieves pressure on your tailbone too so you'll be pain-free, wherever you go!